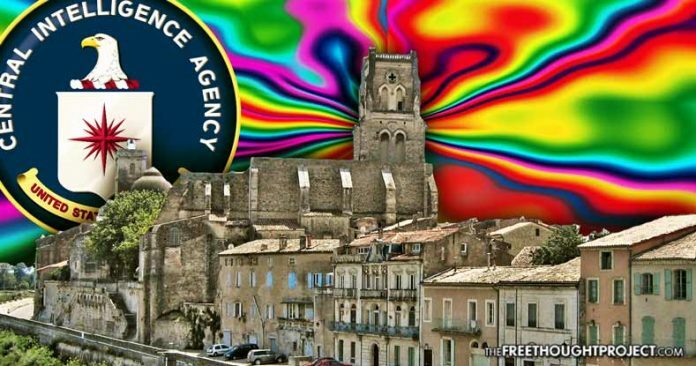 The CIA intentionally dosed a French village with LSD as part of a top-secret mind control experiment according to documents released under FOIA. For decades, after a French village was struck by mass insanity and hallucinations in 1951, it was widely believed that a local bakery’s flour had become contaminated by ergot, a poisonous fungus that occurs naturally on rye and causes hallucinations. However, a discovery by an investigative journalist doing research for a book about the incident uncovered damning evidence that the village’s food was intentionally contaminated with LSD as part of a secret CIA mind control experiment. On August 16, 1951, numerous locals were suddenly stricken with horrifying hallucinations of fire, dragons, and snakes, with dozens being committed to asylums and hundreds left with varying degrees of madness. The incident was known locally as the mystery of Le Pain Maudit (Cursed Bread). A local postman at the time, Leon Armunier, was doing his rounds in the town of Pont-Saint-Esprit when he was suddenly overcome by a feeling of nausea and wild hallucinations. “It was terrible. I had the sensation of shrinking and shrinking, and the fire and the serpents coiling around my arms,” he told the BBC. Armunier, now 87, fell off his bike and was taken to the hospital in Avignon. He recalls being put in a straitjacket and sharing a room with three teenagers who had been chained to their beds to keep them under control. “Some of my friends tried to get out of the window. They were thrashing wildly… screaming, and the sound of the metal beds and the jumping up and down… the noise was terrible. “I’d prefer to die rather than go through that again,” Armunier said. According to H.P. Albarelli Jr., who published a book about the experiment, the incident had nothing to do with ergot contaminated bread, and instead, was part of a top-secret mind control experiment conducted by the CIA. Mr Albarelli came across CIA documents while investigating the suspicious suicide of Frank Olson, a biochemist working for the SOD who fell from a 13th floor window two years after the Cursed Bread incident. One note transcribes a conversation between a CIA agent and a Sandoz official who mentions the “secret of Pont-Saint-Esprit” and explains that it was not “at all” caused by mould but by diethylamide, the D in LSD. Further research revealed that F. Olson, according to the BBC, was Frank Olson – a scientist that had spearheaded research into LSD for the CIA, while Belin was a reference to David Belin, who was executive director of the Rockefeller Commission created by the White House in 1975 to investigate abuses carried out worldwide by the CIA. The Pont-Saint-Esprit and F. Olson Files, mentioned in the document, would show – if they had not been “buried” – that the CIA was experimenting on the townspeople, by dosing them with LSD, according to Albarelli. It is well known that biological warfare scientists around the world, including some in Britain, were experimenting with LSD in the early 1950s – a time of conflict in Korea and an escalation of Cold War tensions. Albarelli says he has found a top secret report issued in 1949 by the research director of the Edgewood Arsenal, where many US government LSD experiments were carried out, which states that the army should do everything possible to launch “field experiments” using the drug. Using Freedom of Information legislation, he also got hold of another CIA report from 1954. In it an agent reported his conversation with a representative of the Sandoz Chemical company in Switzerland. Sandoz’s base, which is just a few hundred kilometres from Pont-Saint-Esprit, was the only place where LSD was being produced at that time. In his book “A Terrible Mistake: The Murder of Frank Olson and the CIA’s Secret Cold War Experiments,” Albarelli explains that he had spoken to the former coworkers of Frank Olson who had told him that the Pont-Saint-Esprit incident was just a part of a variety of mind control experiments that had been carried out by the CIA. One mystery that remains, according to Albarelli, is whether French authorities were aware of the actual cause of the incident. Whether the French government was aware or not, those affected by the CIA experiment have a right to know what actually happened, and why they were used as test subjects for an experiment of this nature — without consent. Please share this harrowing story of innocent civilians being used as unwitting test subjects!